Peter Dutton has threatened to deport or cut off income support to thousands of refugees living in the community. In a disgraceful piece of dishonesty he branded 7500 of them “fake refugees” for not yet lodging their refugee claims. He has set an arbitrary deadline of 1 October for all of them to submit. Yet it is the Immigration Department that has been refusing to allow them to lodge. A large number were not allowed to apply until last October. The group, known as the “legacy caseload” are made up of asylum seekers who arrived by boat after August 13, 2012, when Labor announced its “no advantage” rule and re-opened Nauru. The Coalition refused to begin processing them until it had passed legislation in December 2014, stripping them of the right to permanent visas. This means years more of uncertainty on a Temporary Protection Visa, or a SHEV if they can move to a regional area. They cannot submit applications until they are formally “invited” to do so by the Immigration Department. Of the original 30,000 in the group there are only the 7500 left to apply. The application form they have to complete is 41 pages long, and must be completed in English. It is all but impossible to fill out without legal help. But the government also cut funding for refugee legal services. As a result legal providers are scrambling to fundraise, and rely on volunteer lawyers to complete the applications. All the legal centres have long waiting lists of asylum seekers who need help with their claims. In response to the new October deadline, legal providers told the government that between 3000 and 4000 of them were already on their waiting lists. Earlier this year the Immigration Department began issuing letters to asylum seekers, threatening to cut off their income support payments unless they lodged their paperwork within 60 days. This has forced the centres supporting them to speed up their work. Immigration Department boss Mike Pezzullo admitted in Senate estimates that the 1 October date was actually their estimate of how long it would take them to submit all 7500 remaining claims. But he was unable to explain why Dutton imposed this as an arbitrary deadline. 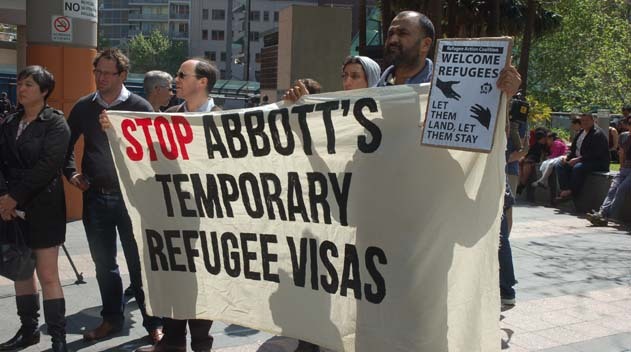 As part of its 2014 legislation, the Coalition also imposed new rules that strip appeal rights from asylum seekers and ensure more of them will be refused refugee status. Under this so-called “fast track” process, the rate of refusal for asylum seekers has grown from 5 per cent to 30 per cent. Those denied refugee status are immediately cut off any income support, and face deportation. The treatment of these refugees is another example of the cruelty and abuse designed to stop them coming here. It has to stop.